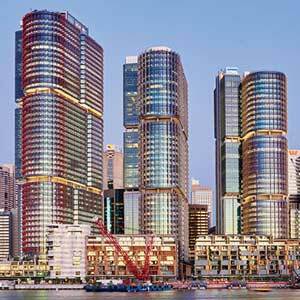 The three towers of International Towers Sydney are the driving force behind Barangaroo, Sydney’s largest urban regeneration project in decades. It unites the CBD with the western waterfront, providing a new financial services hub on Sydney Harbour. The three sibling towers, harmonious but with distinct details providing individual character, are carefully positioned on a radial geometry to maximize access to natural light and views. Opening out over the water, they now mark Sydney’s new front door. The towers’ innovative and sustainable design creates a workplace fit for the future and contributes to Barangaroo South being Australia’s most sustainable CBD precinct, and its first large-scale carbon-neutral community. The dedication to well-being present in the office design helps to maintain International Towers’ position as a leading destination for companies aiming to attract and retain global talent. Day-lit lift lobbies, panoramic prows, 100 percent fresh air, high ceilings, and large open vertical spaces throughout the buildings all combine to promote a state-of-the-art workplace.